Is anyone else obsessed with copper right now? We'll always love gold, but copper is having a major moment. 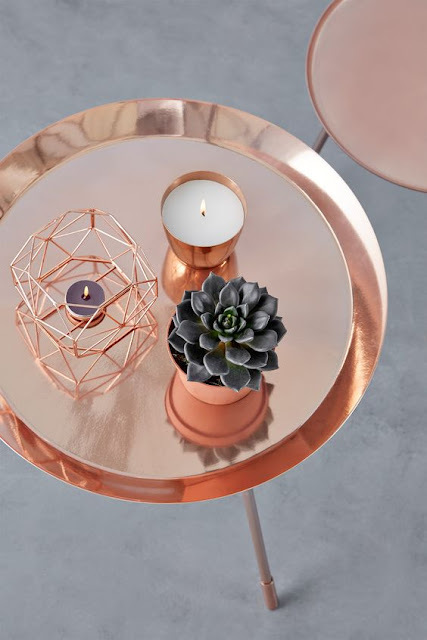 Adding a few touches of copper to your home and wardrobe is a great way to update your space and add a fun, metallic twist to your aesthetic. The Memorial Day sales are here! It's time to use that day off for something productive - shopping, obviously. We've rounded up our very favorite sales for the weekend below! Enjoy your Memorial Day savings! The Nordstrom Half Yearly sale is finally here! Now through June 5th you can shop crazy savings on the cutest clothing, accessories and decor! Check it out before it's over - shop a few of our favorites below! Remember the amazing Cupcakes & Cashmere clothing collection? Well now you can get that same breezy, boho style in your home! The Cupcakes & Cashmere Home Collection is now available at Nordstrom and it's like your Pinterest home board came to life. Check it out below! Have you ever wondered how much of your life you've spend sitting behind a desk? Yeah, we don't want to think about it, either. But if you're going to spend so much time there, it should be cute, right? Some good desk accessories can completely rejuvenate your work productivity and make your desk feel like a home away from home! We've compiled some desk decor from our favorite brands - think Kate Spade, ban.do, and Joanna Gaines' Magnolia Home - to make your desk adorable and functional! Time to get to work! Time for the most obvious statement ever - we love jewelry. Amassing tons of cute necklaces and bracelets and earrings is basically our favorite hobby, but all those adorable pieces need a home! Step in: jewelry storage. If you don't have jewelry organizers, you are seriously missing out. Not only do they add some flair to your vanity, but they are super practical and keep everything looking clean and in order! Below we're showing you a few of the best jewelry organizers out there! For the girly girl - bows, polka dots, and lots of pink will keep you feeling sweet and sassy when adorning yourself for the day. Want a jewelry organizer that could pass for art? We've got you covered. If you love statement pieces, say it with a tray! Need your jewelry on the go? These travel organizers will be a lifesaver. It's back - your favorite excuse to treat yoself. That's right, it's the 25 Under $25! We've compiled the best and least expensive items for the month just for you to enjoy without breaking the bank. Grab a little something for yourself below! It's time to face the music - you're an adult. Okay, maybe you've been an adult for a while now...and if that's the case, shouldn't your things should reflect that? After all, awesome, powerful women deserve high quality, classy things. Check out four things in your life that are probably overdue for an upgrade. Besides, adulthood is the perfect excuse to get some new, well made goodies. Hey, one part of being a grown up should be fun, right? If you're still using Bath & Body Works body splash, it's time to get a real signature scent. Not only does real perfume last longer, but these bottles look gorgeous sitting on your counter. Dab a little behind your ears and you'll never feel classier. Generally we think real pajamas are for queens and fairy tale characters, but these lounge options are just the right upgrade to the ratty t-shirt you normally wear to bed. Trust us - making coffee in these duds will make your morning feel far more luxurious. You're the queen of your household, after all. Seriously - pretty bras make a difference. They make you feel beautiful and basically get you bonus points in #adulting. Plus, we're willing to bet you're in need of a bra that isn't saggy, stained, or falling apart at the seams. These will give you that little spring in your step you've been missing. Everyone needs a big girl wallet. If your wallet has seen better days or - say it isn't so - has velcro, it's time to step it up. You bring this thing with you everywhere - shouldn't it look nice? Congratulations! You are four steps closer to figuring this "adulthood" thing out. But they actually can be! These florals are a twist on the traditional flowery dresses you see when the weather gets warm. With edgier colors, interesting silhouettes, and unique patterns, the looks below will challenge you to rethink your floral game! Check them out - we know even Miranda Priestly would like these. Welcome back to wedding season! We love weddings, but sometimes we need a little help to get through the day. Check out our favorite things to keep your eyeliner from running, your feet from falling off, and your night from going stale! Waterproof, waterproof, waterproof. Did we mention your make-up should be waterproof? If you get weepy at weddings like we do, make-up that won't budge is a must. Be sure to check out the eyeliner - you can literally sob in this stuff and your cat-eye wings will be intact. Don't forget blotting papers if you might sweat (at an outdoor venue OR on the dance floor), and a finishing mist is also great to keep everything in place! When it comes to weddings, the heels must be chunky. Why, you ask? Sinking into grass or tripping over yourself while dancing is not a good look, ladies. Grab some shoes with a thick heel to avoid public humiliation and/or foot cramps. Need to inject a little fun into the wedding? Be the girl passing out adorable handkerchiefs during the ceremony, snapping instant photos at the reception, and (we won't tell!) sharing the flask! Don't forget a backup charger for those #weddinghashtags and a showstopping necklace! Now eat, drink, and be married! So what are your plans for this weekend? You didn't forget that it's Mother's Day, did you?! No worries - we've got you covered. Here's some awesome ideas to celebrate Mom this weekend. And don't forget to check out our gift guide! Tell Mom it's time for her to put her feet up...and into an awesome foot spa. Have an at-home spa day with your mom and gab about life while wearing face masks and doing your nails. Not the DIY type? You can always grab a spa gift card instead! Go enjoy the spring sunshine with a picnic. Bring along a basket and some goodies, and don't forget your sunglasses and a floppy hat! Your mom will adore sipping drinks and soaking up the sun with you! Whether it's the beach or the lake, a weekend getaway to the shore is the perfect Mother's Day gift. If you haven't jumped on the coloring book trend yet, grab one to work on while you lay out, and don't forget some cozy pj's for the trip! Mom deserves a splurge. Spend the afternoon getting ready together in your fanciest duds, and then take her out to the nicest restaurant in town. She's worth it! Is everyone else as obsessed with the tassel trend as we are? Tassels are such a fun detail for spring and summer--they add a boho, carefree touch to any outfit. And they look good on pretty much everything, from clothes to shoes to jewelry to bags! Want to get in on the tassel trend? We picked out our favorite, fun tassel pieces below!